Château d’Aigle, an historic castle beautifully surrounded by vineyards, is photogenic at the best of times but never more so than during autumn when the vines turn yellow, orange, and red. Château d’Aigle is a Swiss castle with medieval roots located in the Rhone Valley at the foot of the Vaud Alps very close to Lake Geneva. The castle is surrounded by vineyards and currently even houses a wine museum. The historic fortress is very photogenic and especially so during autumn when the leaves of the vineyards turn into a sea of gold, yellow, orange, and red. The views from Castle Aigle are as good as the views of the castle sitting in the mids of vineyards. Visiting Château d’Aigle is very pleasant both to see the castle as well as to enjoy the views from the windows, arrow slits, sentries’ wall walk, and several towers. 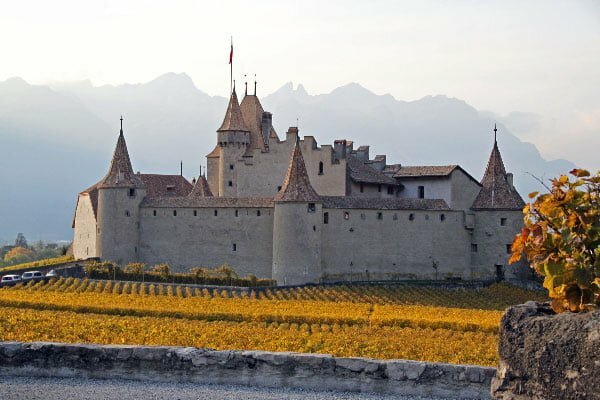 The castle is home to the Vine and Wine Museum (Musée de la vigne et du vin), which combines historic objects with modern, interactive displays. Aigle Castle and museum are open from April to October. The exterior of the castle can be enjoyed year round but the vineyards are their most beautiful late October to early November. Several hiking and cycling routes pass directly by the chateau. See also Visit Chateau d Aigle with Wine Museum for more on the castle and transportation information. Aigle is within easy reach of the Lac Léman region both by car and public transportation. The Lake Geneva region and the Rhone Valley generally enjoy long autumns. The photos below were taken the last Sunday of October when afternoon temperatures were still well over 15°C.